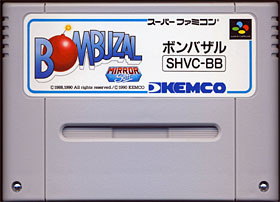 Bombuzal is a puzzle/action game by Mirrorsoft. The hero is a blue potato-like character with arms and legs. His given task is to blow up all the bombs on each level within a time limit. Each stage is made up of tiles and some of them have special abilities - they can break as our hero steps on them, be slippery because made of ice, teleport and so on... The goal of the game is to clean up all the bombs dotted around each level - but the task is not simple and they often have to be strategically detonated to set off a majestic chain reaction. However, our hero must stay away from the massive explosions without blocking himself up or jumping off a tile - which in both cases means instant death. Bombs come in different sizes and flavors - standard bombs detonate and blow up nearby bombs but others will light up all the same size bombs on the stage. Bombs can also be moved around when placed on special striped tiles. Later in the game, a pair of remote controlled robots can even be used to detonate bombs while hiding in a safe place. 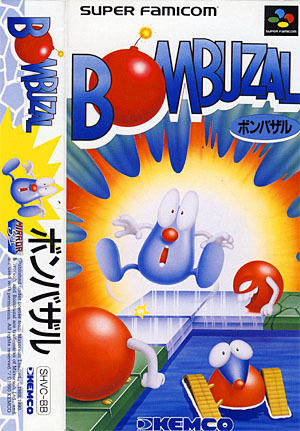 Bombuzal is viewed in a classic 3D isometric view, but it can also be played in a easier to see overhead mode. The game is supposed to have over hundred levels and a password system helps the player to save his progress. Bombuzal is the perfect example of an interesting idea badly executed - I know, this is a bit harsh but it's the shortest way to express the feeling you get when blowing up these bombs... graphics are a bit bland and the main character looks like a blue Mr.Potato Head - this is not a bad thing in itself, really, but it deplorably contributes to the bland after-taste the game leaves after you play. Then stages are monotonous and our potato friend can be a pain to control - Bombuzal is like an occasionally charming but often flavorless diversion.